I don't know if you know about GDB Pretty-Printer. GDB Pretty-Print let you print your debug output in a legible way. I tried to write the Pretty-Printers analyzing the SystemC 2.3 implementation and I was learning how the information is stored within the SystemC implementation. You will find the Pretty-Printer under following link. On Github you will find instructions about installing the Pretty-Printer and a verification python file. Hope this Pretty-Printer helps you and does not cause to many problems. I were also able to use them within Eclipse. I think we need something like that to be bundled with reference SystemC implementation. Thanks for your contribution. That's very good to have! Do you have something similar for sc_in/sc_out/sc_inout types? If I put a breakpoint with gdb on the return statement, and try to print sc_signal/sc_in/sc_out elements, I get not pretty-printed elements. Do you know what can happen here? Thanks, I had noticed that. But then, why would I reach a pretty-printer if those types are not supported? By curiosity, may I know how you manage signals/ports? Hard to say without debugging. In source code I see they are registered using "RegexpCollectionPrettyPrinter", probably sc_dt::sc_int<(. *)> matches sc_signal<sc_int<2>> ? Signal has m_cur_val and m_new_val fields, storing current and next signal value. So they are pretty-printed as "m_cur_val -> m_new_val". Ports are just decorated pointers, signal port has m_interface field holding a pointer to signal, so pretty-printer dereferences it, casts to dynamic type and prints it the same way as signal. Actually you can do much more with GDB Python API. 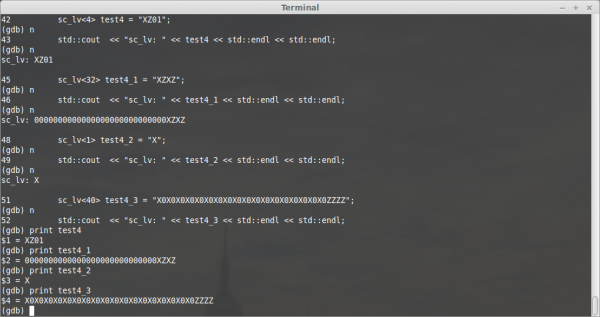 I have even written SystemC to Verilog converter using GDB (Generates complete netlist, but without process bodies). Commercial SystemC interactive simulators/debuggers are also based on GDB AFAIK.